Industry Files Amici Curiae Brief in Lawsuit Against Governor and Humane Society. WASHINGTON — 12 March 2013 — On March 4, 2013 the Sustainable Fisheries Association (SFA), a Massachusetts-based nonprofit organization representing New England Atlantic spiny dogfish shark processors, joined a California legal battle arguing that a state law banning the sale and transport of shark fins is both wasteful and unconstitutional. The ostensible purpose of the law was to reduce or eliminate the reprehensible practice of shark finning, in which the fins of a live shark are removed at sea, and the shark is returned to the sea to die, unable to swim. But the law also bans legally obtained shark fins. SFA, representing a fishery deemed “sustainable” by both the Marine Stewardship Council (MSC) and governmental regulatory bodies, takes issue with that aspect of the law, and filed an amici curiae brief with the U.S. District Court for the Northern District of California explaining their concerns. The Atlantic spiny dogfish fishery is concerned about the law because it prohibits their ability to ship legally and sustainably obtained Atlantic spiny dogfish fins through California to other states and nations in which demand for the species’ fins is both high and lucrative. Though comprising only 3% of an Atlantic spiny dogfish, the species’ fin accounts for nearly 40% of profits generated by its overall sale. Without access to California’s ports and roadways, the fishery is poised for potentially catastrophic financial losses. The suit was filed jointly by the Chinatown Neighborhood Association and Asian Americans for Political Advancement, and names California Governor Edmund Brown as the defendant. The Humane Society of the United States, which advocated for the law’s passage, joined the suit as a co-defendant. SFA’s brief is coauthored by the Garden State Seafood Association (New Jersey), the North Carolina Fisheries Association, and the Virginia Seafood Council. Their amici brief details concerns for the ban’s legality, specifically regarding violations of the Supremacy, Commerce, and Equal Protection Clauses of the United States Constitution. It also notes that California’s ban does not prohibit the transport or sale of shark meat in general. But its prohibition on shark fins specifically means that those selling legally obtained Atlantic spiny dogfish are forced to waste a portion of the fish otherwise legal throughout the nation and world, squandering an especially lucrative portion of a fish whose harvest is already closely regulated by federal laws concerning sustainability and humane practices. Central to SFA’s concerns is the Supremacy Clause of the U.S. Constitution, which explains that state laws are void when preempted by federal law, or when in conflict with treaties with foreign nations. That is exactly the case for California’s ban on shark fins, according to SFA’s amici brief. By prohibiting, “citizens of other states, and other nations, from shipping legally caught shark fins through the State of California to foreign and domestic destinations,” the California ban violates the Supremacy Clause by inhibiting foreign treaties. The law also, “seeks to occupy a field of law already fully occupied by federal law,” the brief continues, arguing that the state law is preempted, and thus void, by existing federal laws concerning the same legal areas. SFA’s amici brief also details concerns for violations of the Commerce Clause, which forbids states from restricting the flow of interstate commerce. The brief explains that the California fin ban, “unconstitutionally isolates California from the use of its channels of interstate commerce (i.e. ports, airports, and freeways) by restricting the flow of economic commodities like shark fins from out of state businesses.” Put simply, the law’s ban on the interstate flow of fins like those of the Atlantic spiny dogfish means that the interstate transport of a legal commodity is restricted by the state law, and therefore in violation of the Commerce Clause’s provision banning exactly such restrictions. 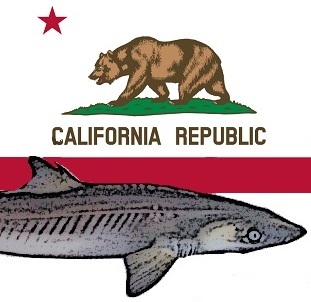 SFA also lists concerns regarding the U.S. Constitution’s Equal Protection Clause, and by extension the Privileges and Immunities Clause, writing, “The Shark Fin law discriminates against out of state fishermen in favor of California fishermen.” In allowing California fishermen to possess shark fins within the state, but prohibiting out of state fishermen from doing the same within its borders, California’s law creates a circumstance in which out of state citizens are not entitled to the same legal privileges and immunities as those who are native to California.